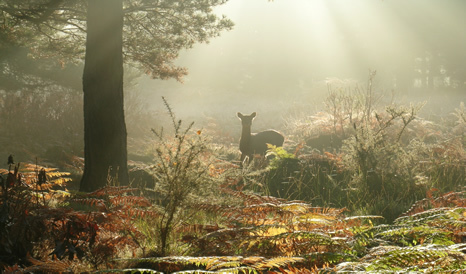 Ecological research work by Dr Anita Diaz that focused on the introduction of Sika deer in Purbeck and the New Forest has highlighted the increasing benefits of student-led consultancy and research work. Students from the Student Environment Research Team (SERT) and recent BU graduates, under the guidance of Dr Diaz, worked with the National Trust and with the Royal Society for the Protection of Birds (RSPB) to monitor the quantity, distribution and impacts of Sika deer in Purbeck after they were introduced to the UK from Japan. The students have played a key role in the projects which highlighted the importance of understanding how the abundance and distribution of Sika deer affect a wide range of species and habitats. Positive effects include their usefulness in managing wet heathlands, home to rare species, such as Silver Studded Blue Butterflies, and newly created meadows. Their research has also shown that numbers need to be managed to prevent over-grazing of important salt marsh habitats and to protect neighbouring areas of forest and crops. Details of the research were highlighted on a Radio 4 programme ‘Nature: In Search of the Japanese Sika’ and the students’ deer survey work also featured on a Channel 4 programme ‘Wild Thing’, one of a nine part series where experts were called in to examine a problem where wildlife is put at risk. The programme showed the students focusing on the habitat of the deer, as well as their breeding and feeding habits. It gave a fascinating insight into how students can get involved directly in cutting edge research that brings tangible benefits to external organisations. Exposure of this kind also helps to raise the profile of the type of student led consultancy work that academics like Dr Diaz are helping to drive as part of BU’s student experience. Dr Diaz says: “The deer count led by the National Trust recorded over 500 Sika deer and is a great way of monitoring change in the overall abundance of Sika deer across Purbeck. I am delighted that our students contributed to this essential part of building understanding of how Sika deer interact with local habitats and people. Understanding and managing the relationships between introduced species and local habitats and people is one of the great global challenges for conservation ecology. “For students to get the opportunity to work directly in support of a high profile organisation such as the National Trust is a great way to enhance their learning process and give it ‘real world’ context.